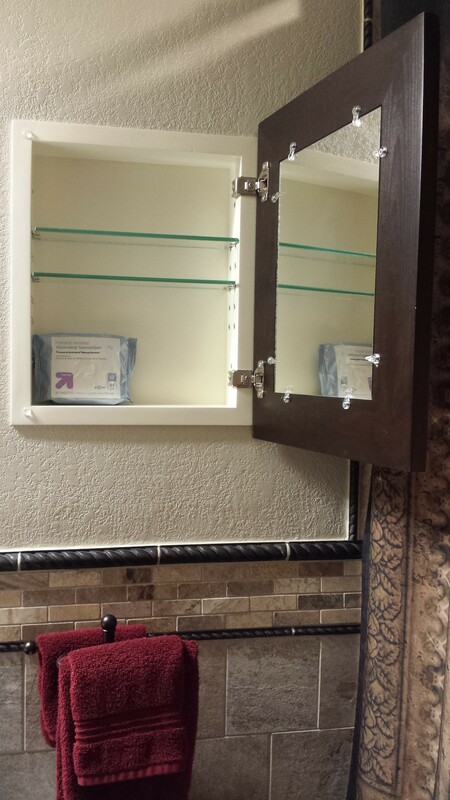 Customer Photos | Testimonial reviews for the world's only recessed medicine cabinet with a picture frame door and no mirror! Here's where our past customers get to tell (and show) our future customers about their Concealed Cabinets. "...I've got a great looking open vanity with no drawers or doors, a beautiful mirror hanging above it, and an ugly, metal filing cabinet next to both because I didn't have a single spot to store anything out of sight. 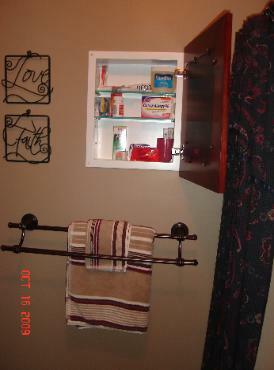 Thanks to my Concealed Cabinet, I can now hide tons of stuff and I don't have to have that tacky mirror on mirror look to do it." To read Bret's full testimonial, click here. 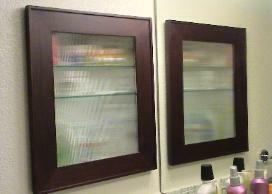 I just updated both of my 1960 bathrooms and wanted some additional storage but didn’t want the standard medicine cabinet and didn’t want another mirror. 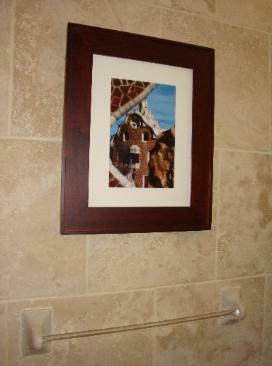 Was thrilled to find your website and ordered one for each bath – both with the distressed whe frame and white interior. 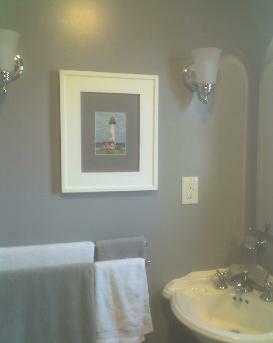 For the large in the guest bath, I used a pretty Vogue cover from 1916 that I found on etsy and it is perfect, For the extra large in the master bath, I cut a piece out of an inexpensive canvas abstract oil painting that I was getting rid of and I inserted it without the Plexiglas. It has all the colors I wanted and looks awesome! 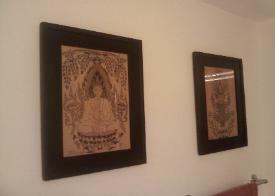 I love having storage AND two pieces of art. 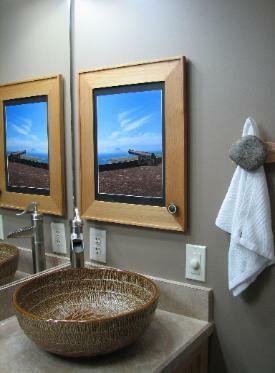 My friends love the cabinets, and – as a realtor – I will be recommending them to my clients who are redoing their baths! 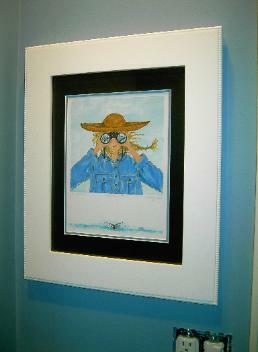 Installation was a breeze and I loved all the frame choices. One thing I read in some of the past reviews was that the shelves were a bit unstable. I solved that by sticking a clear rubber one half inch bumper just above each shelf in the middle of the shelf. Shelves are now extremely stable. I LOVE these cabinets! 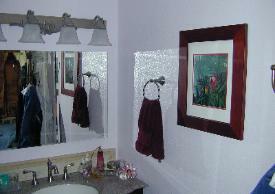 "We didn't want or need a mirrored cabinet distracting from the new beveled glass mirror and an online search led me to you folks... [The Concealed Cabinet] is very well made, fits great and I really like the option of changing the look with different photos or artwork..."
To read Gary and Darlene's full testimonial, click here. 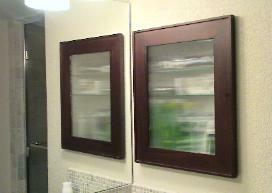 "The cabinets are beautifully made and our contractor was so impressed he said he would like to use them in future jobs. 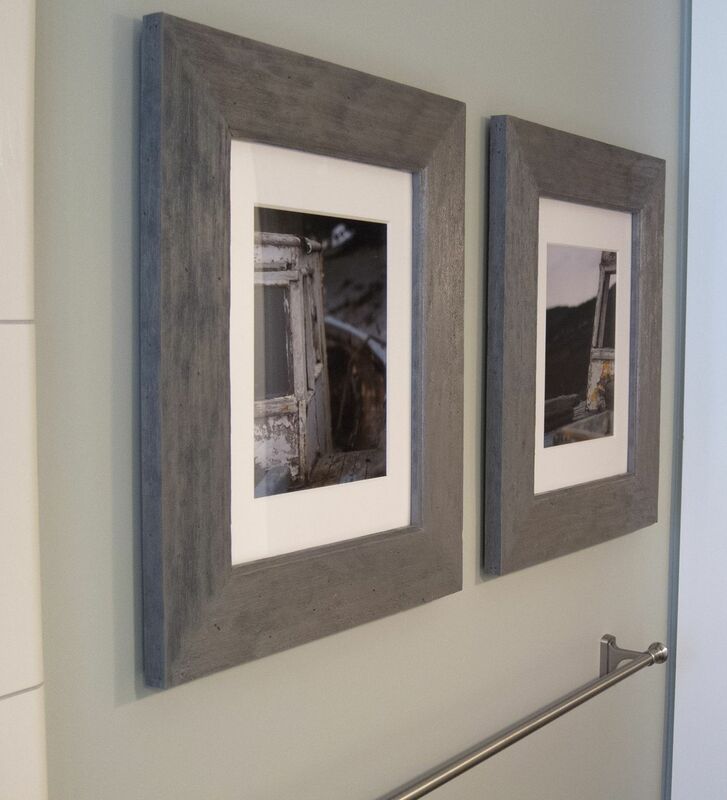 Your product made it possible for us to add much needed storage to our small bathroom without having a room full of mirrors or shelves, and the range of unfinished options meant we could truly personalize them to our photography and space. They were beautifully packaged, easy to disassemble for finishing and easy to mount one opening left and the other opening right so they wouldn't interfere with each other. 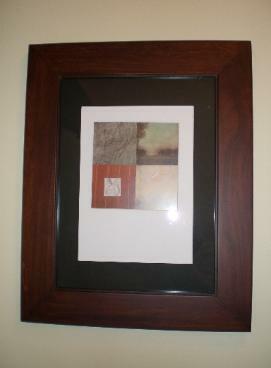 Also the rustic frame adds a great texture to the space. We were happy with our experience from being to end." 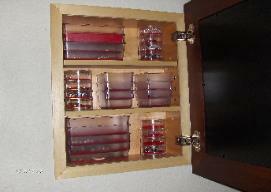 "We are SO pleased with this cabinet. The quality wood & construction is excellent. It is exactly what we wanted. 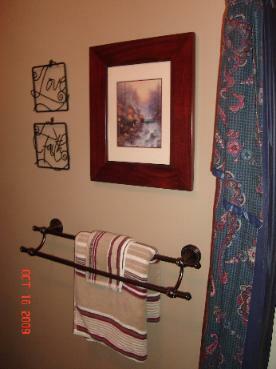 Also the hanging instructions and hardware were easy to use. Took little time to install. 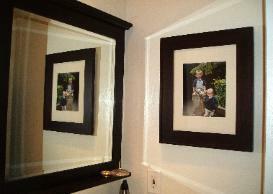 And rather than a mirror we put in a picture of our choice and it looks so natural in the frame. That was also easy to install." "My wife and I had always dreamed of building a mountain house in North Georgia. 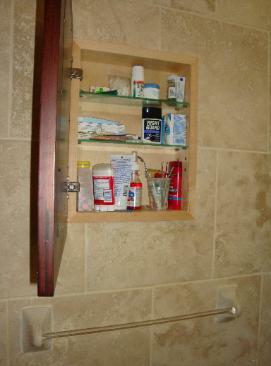 While designing our home, we both agreed that a medicine cabinet in the master bath was something we wished to have. 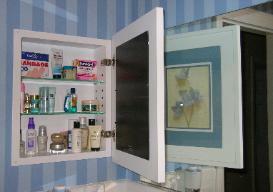 I was skeptical of ever finding one as my image of a medicine cabinet was an ugly looking, chrome rimmed, oversized box, with only a mirror as the option for the face. 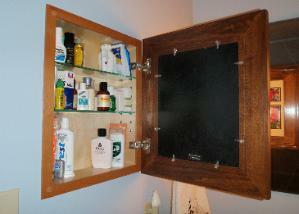 But after researching the internet I came upon The Concealed Cabinet site. It was the answer to our quest. We purchased the large, unfinished cabinet even before the house construction began. 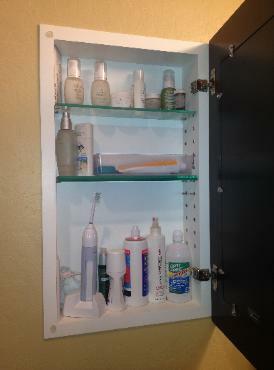 We literally built the bathroom around the cabinet! 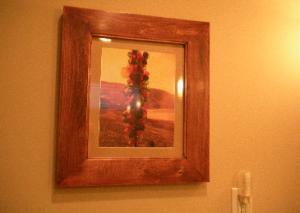 Our builder installed the cabinet and then stained it to match the color of the rustic base cabinet in the room. I think all would agree the result was perfect; exactly what we had envisioned. 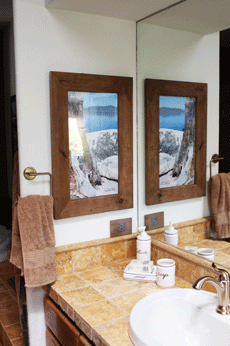 Thanks for such a great product that adds so much to our Mountain Dream home; both visually and functionally." 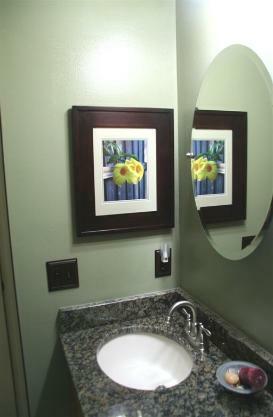 "I recently did a 'refresh' in two bathrooms and had Regular Espresso Concealed Cabinets recessed in both. 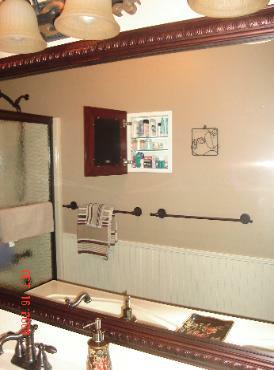 The cabinets are of excellent quality and exactly as seen/advertised. 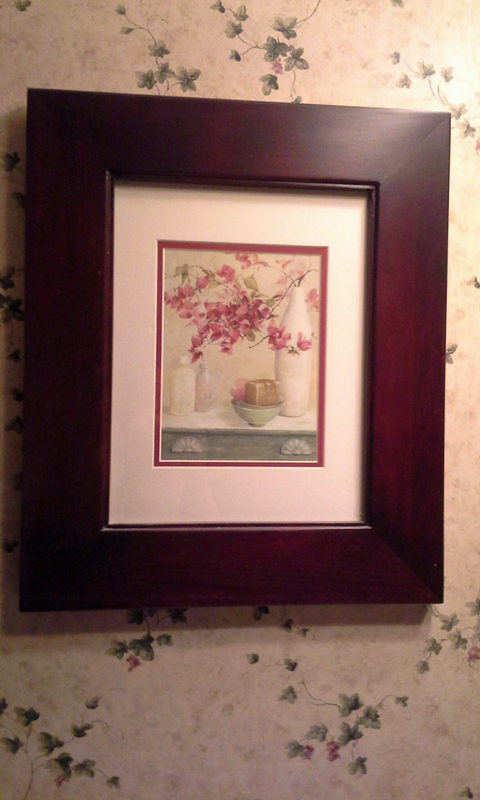 I currently have one of my favorite Thomas Kinkade prints displayed, but the beauty is that I can change it at any time. 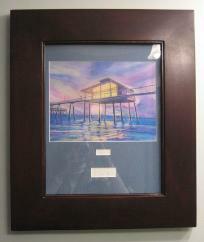 Thank you for a truly innovative and well made product that I am happy to have in my home." 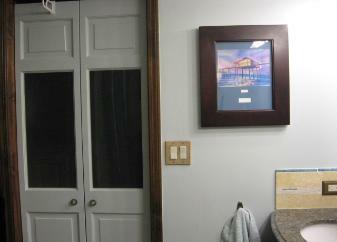 "I am blinded by the sheer awesomeness from the difference our Concealed Cabinets make! Our two Regular Cabinets with special 3" depth provide excellent amounts of storage while our Extra Large Concealed Cabinet is a powerhouse of capacity! 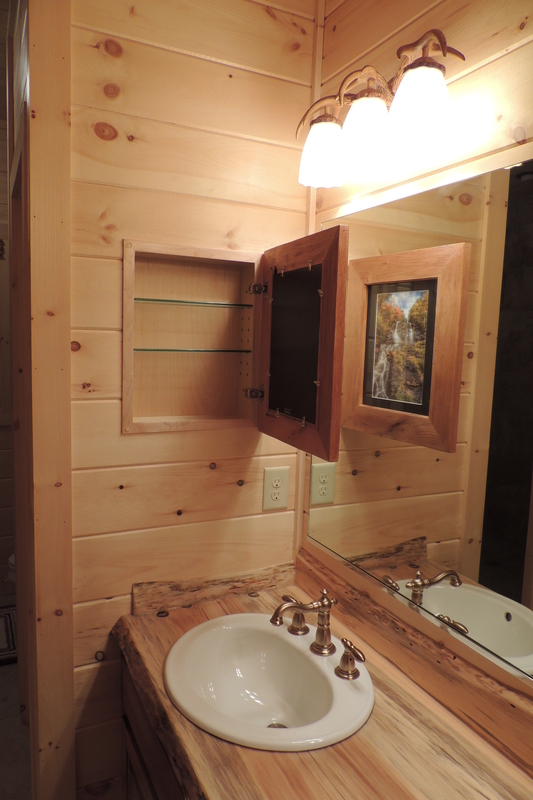 AND for added practicality, we purchased mirrors for the inside of all three doors which provide excellent close up mirrors for shaving, plucking, make-up, etc! Not to mention the skillful design, true craftsmanship and beauty of these super stylish cabinets cannot be found anywhere else. I feel so ahead of the trend curve! 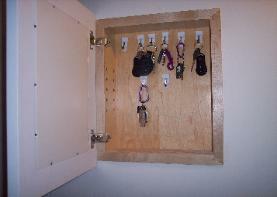 Thanks Concealed Cabinets!" "We are 100% satisfied with our [Concealed Cabinet]. 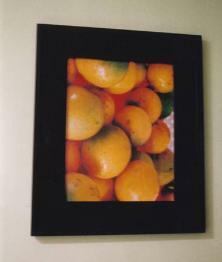 Everyone thinks it is merely a photograph and frame. 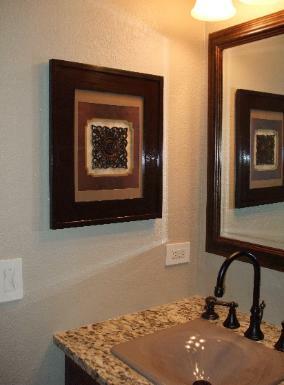 The staining matches our vanity and it is just perfect! There is ample room inside for what we need and it serves our purposes in just the way we imagined. Thank you again so much for your guidance and for this excellent product. 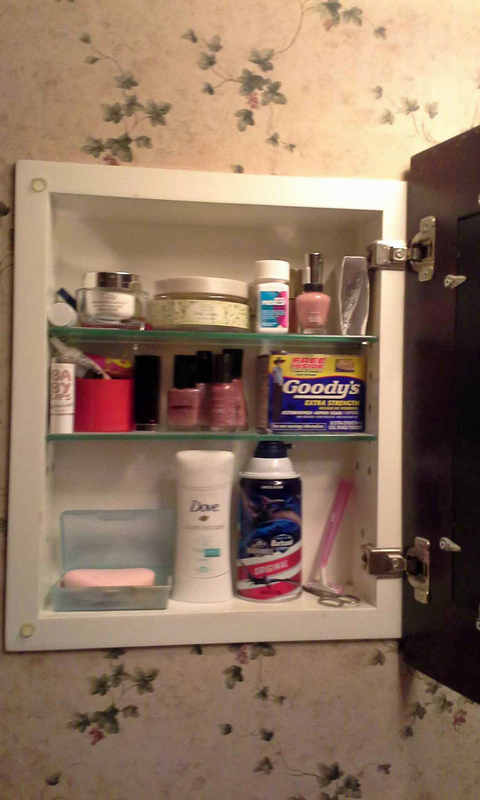 We would recommend you and your [medicine cabinets] without reservation. PS - Our cabinet is a TOTAL shock to everyone who sees it when it is opened!" To view a video testimonial that Ossie was nice enough to upload, click here. "We love your products! 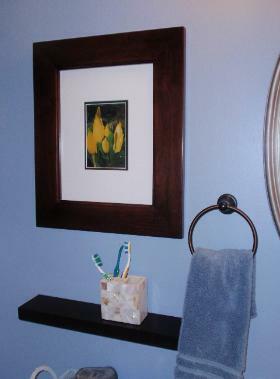 The Wall Niche was well-constructed, easy to install, beautiful, and functional. Our house is very space efficient and the addition of the Wall Niche addressed our need for a place for our keys and security system controller without losing valuable floor space to a console. Thank you." "We absolutely LOVE the Concealed Cabinet. 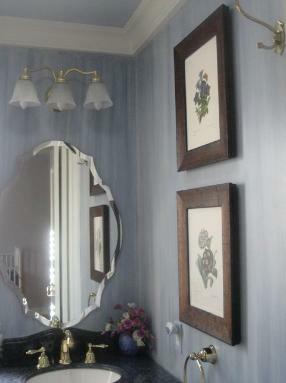 We didn't want another mirrored cabinet right beside the big mirror. This was the only other option available (and I searched EVERYWHERE)." 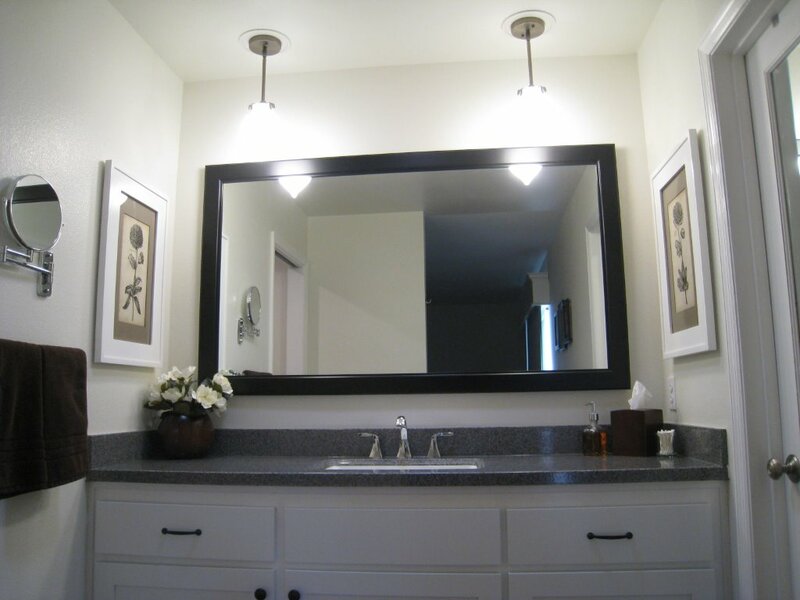 "I had my master bath room remodeled and the thought of putting the usual medicine cabinet back in was not appealing to me at all. 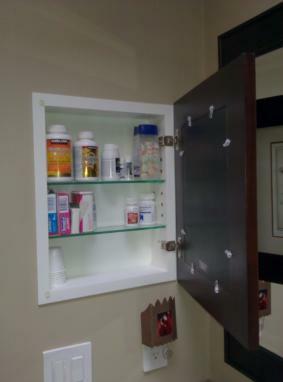 I went online to see if there was something different that I could use as a medicine cabinet and came across these concealed cabinets. Fell in love with them from the web page. When the cabinet arrived at my home, I could not have been happier. 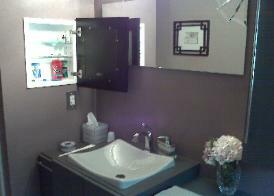 When the contractor installed the cabinet in my bathroom, I was thrilled!!!! 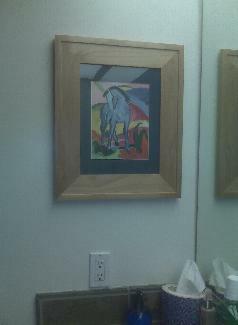 Every morning when I go into the bathroom, I get to look at this beautiful picture frame cabinet with a wonderful picture. I love the fact that I get to change the picture whenever I feel like it. 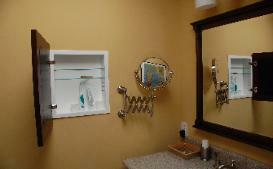 I love the fact that I don't have the usual medicine cabinet looking thing in my beautiful new master bathroom. 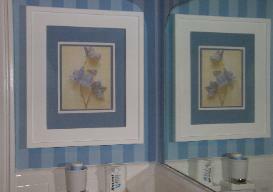 I will be remodeling my guest bathroom next year and I will be purchasing another one of these cabinets to put in that bath room. I love this product!!!!" 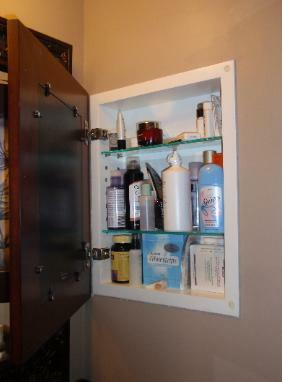 "The Concealed Cabinet [is] different than any other medicine cabinet I've found on the market. 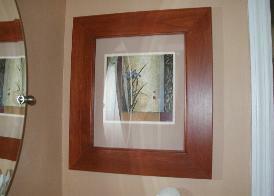 It is a well made product using good woodworking techniques and quality components. I especially like the option of purchasing it unfinished. 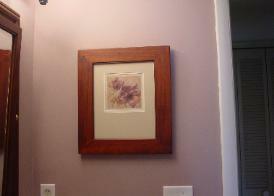 I sent it to my cabinetmaker who applied the same stain on the frame as he put on the bathroom vanity. The Concealed Cabinet looks like it was custom made. I am very happy with my Concealed Cabinet. Thanks for an innovative, functional and quality product!" 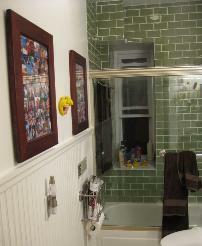 "I am 100% thrilled with how our new bathroom turned out. In a few days we are having a party and I can’t wait to show my friends what we have done. I think they’ll be impressed when I let them in on the secret of the cabinets." 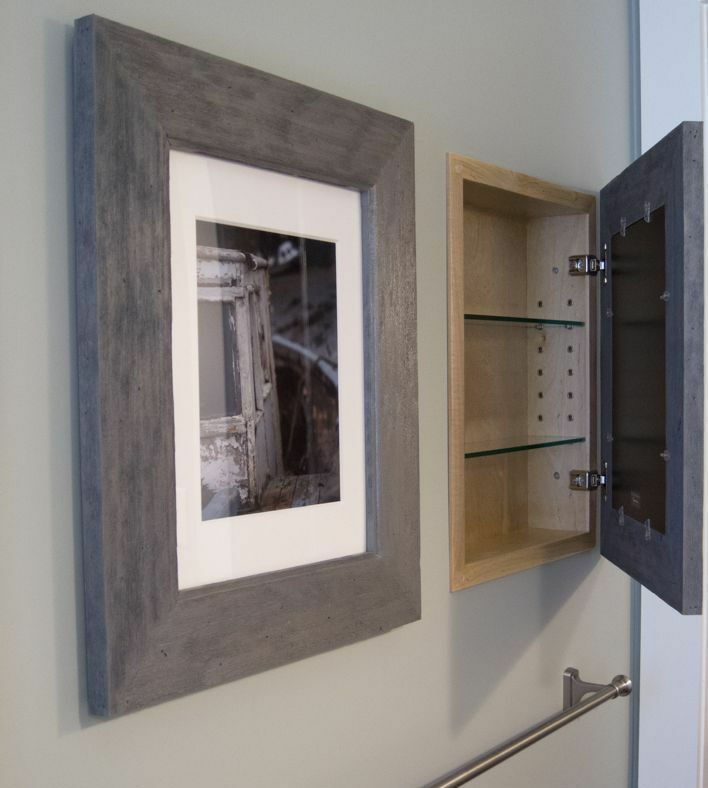 "The quality of the frames is first-rate and we are so pleased with the product that instead of letting it be a hiding place for the bathroom, we brag to everyone that sees our renovation, showing off our clever storage. This is truly one of the most innovative products I have seen. Couldn't be happier." "I can't tell you how much I love my concealed cabinet. It's been many years since I purchased it and I love it like day one. I went crazy going from store to store and found nothing that appealed to me. 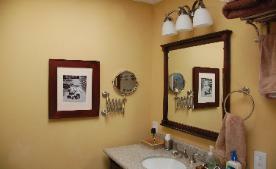 I completely renovated my bathroom where the only thing left from the old bathroom was the four walls. 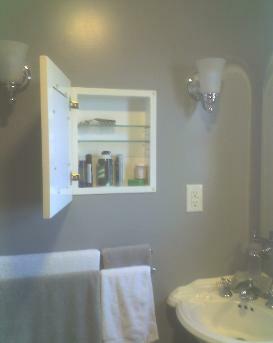 My Concealed Cabinet is the thing that I love the most about my new bathroom. I will purchase another one when the time comes that I renew my other bathroom. I am so glad that I found your website - I can't imagine anyone not being 100% satisfied with your product. A very satisfied customer." 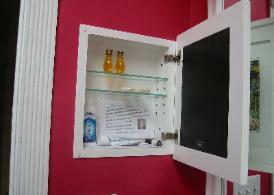 "Here are some photos of our Concealed Cabinet. We love it! It is exactly as described on your website and is very well made. We had an electrical outlet put inside for our toothbrush recharger. Thanks for such a great product!" 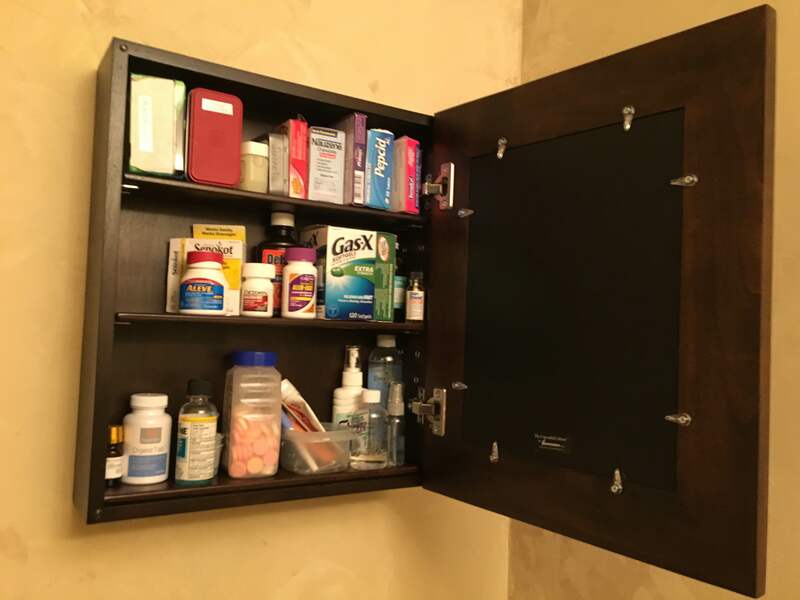 "I searched a long time for a medicine cabinet that didn't look like a medicine cabinet and stumbled onto your Concealed Cabinets. I ordered one and loved it. All my friends loved it too when I showed it to them. 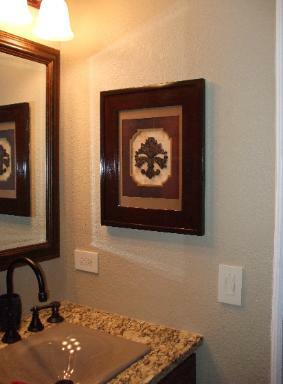 In fact, my husband and I liked it so much we ordered two more for the second bathroom. It's classy and stylish. The customer service was good too." "...we can not decide who gets the credit for finding your cabinets or deciding to make a purchase. 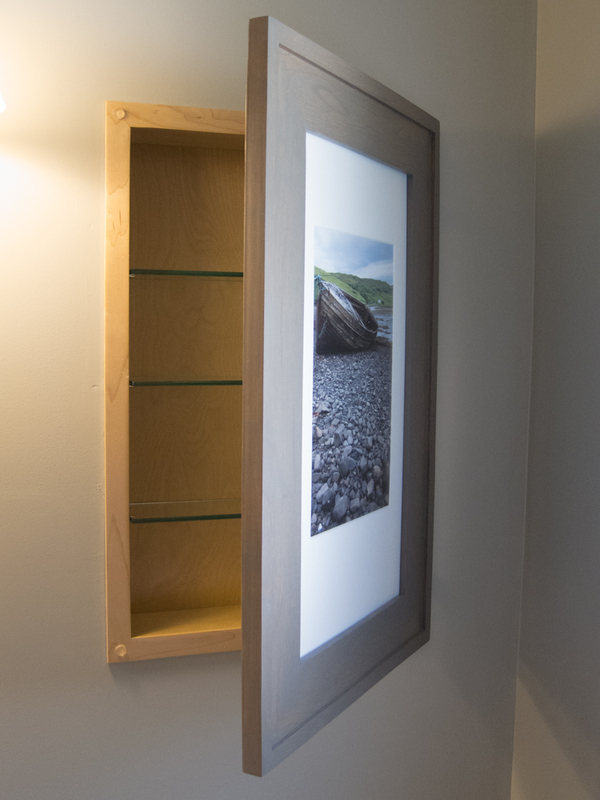 What we do agree on is that the [Concealed Cabinet] is a GREAT addition to our project and as avid photographers we plan to change the photo quite often." 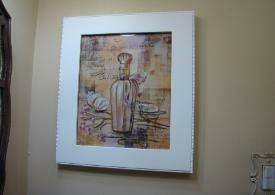 "I absolutely love my Concealed Cabinets. 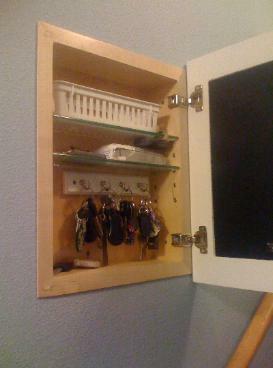 They are a classy and clever way to store items you want easy access to. 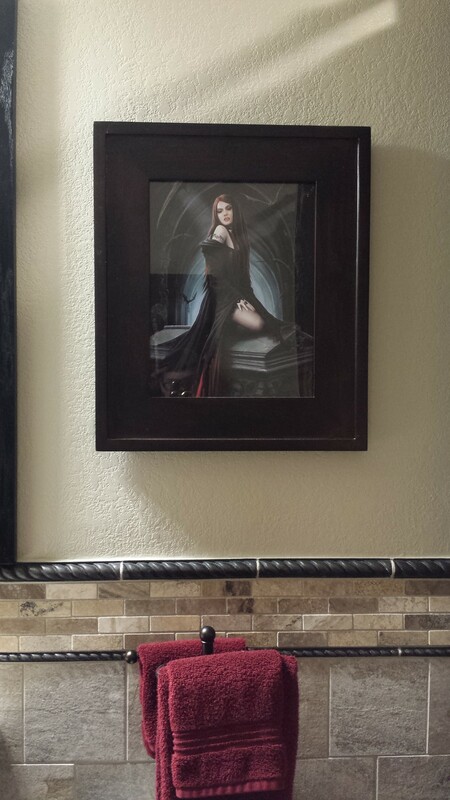 Initially, I ordered one for the first bathroom I remodeled. 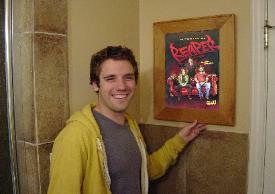 It was so great, I ordered two for the next bathroom!" 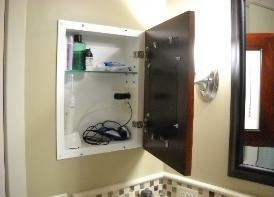 "I purchased the Large Coffee Bean Concealed Cabinet for my bathroom. 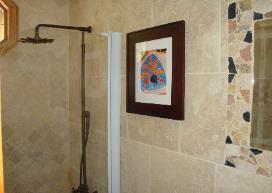 It looks fabulous with my travertine tile and wall color. I like the idea of switching out the photos every so often. It fits perfectly and is well made. Thanks so much i-innovators. Awesome product!" 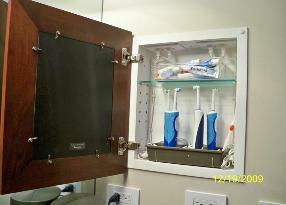 "Here are two photos of our recently-installed Concealed Cabinet in our bathroom. We love it!! 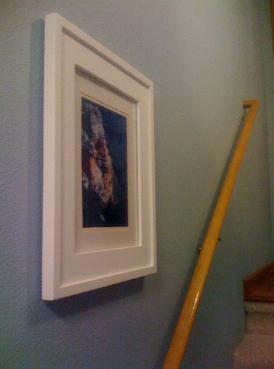 Well-made, easy to install and a perfect way to showcase some art. 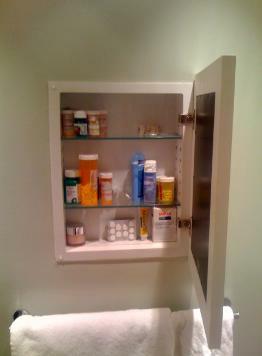 No one can tell it's a medicine cabinet!" "I love the Concealed Cabinets! They are just what I was looking for! I've been showing them off and I've directed several friends to your site. Great quality, fabulous and immediate communication, and quick delivery! Bravo!" "Very happy with the finished appearance. Was hesitant installing this product at first sight-unseen knowing I would be tiling around the cabinet, but it worked out great. Nice product!" 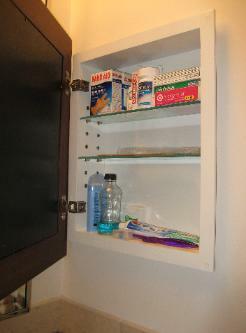 "We've finally gotten our new Concealed Cabinet in, and we love it! 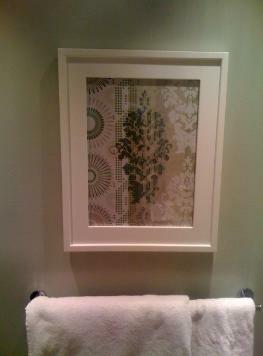 It hides bathroom essentials beautifully and was a snap to install. We love the quality and the fact that it was made in America!" 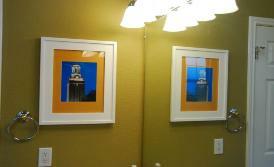 "My husband and I recently did a complete makeover in both of our bathrooms. We did some re-arranging of cabinetry in one of them, and had to give up one cabinet over our sink which held my husband's toiletries. 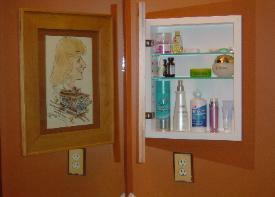 The Concealed Cabinet was the perfect solution for our need. 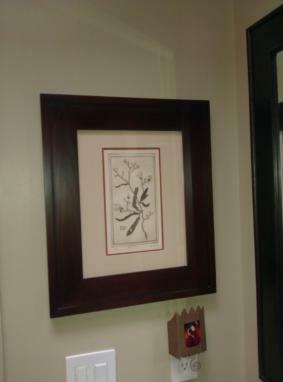 This room is small, but with the Concealed Cabinet, I was able to have one wall to display artwork, while gaining the advantage of extra storage space. I love the idea of any furniture or product that does double-duty in a home. The cabinet is a lovely quality, and we receive many compliments on it, when I surprise friends by opening my piece of "art." I have every intention of ordering a second cabinet, in white, for our upstairs bathroom. Great product!" 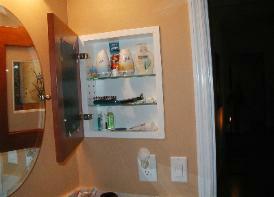 "I love the Concealed Cabinet! 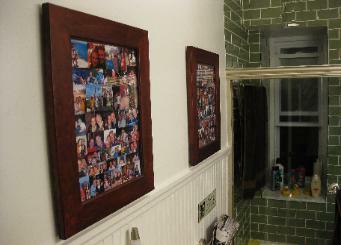 Everyone who has stopped over to see my 'new bathroom' thinks it's great too. The quality [is] excellent." "This was one of the best things I have found. 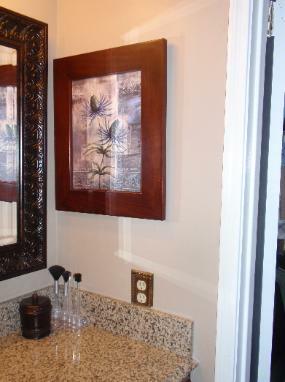 We have two Concealed Cabinets in our... main bathroom so I use one for a medicine cabinet and I put two outlets in [the other one to hide] our electric toothbrushes. Now I don't have all our toothbrushes and the chargers all over our counter top. I change the pictures for every season. 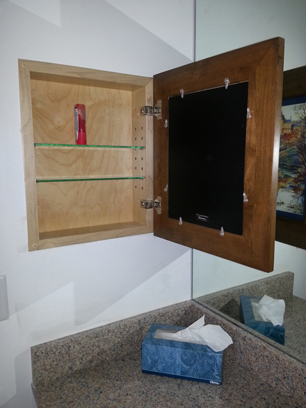 People are amazed when I open the frame and show them the hidden cabinets." 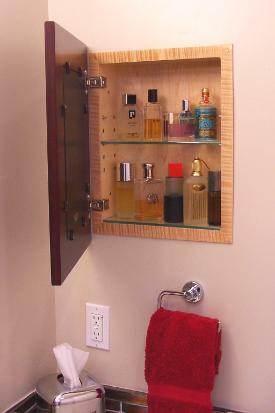 "We LOVE our Concealed Cabinet... 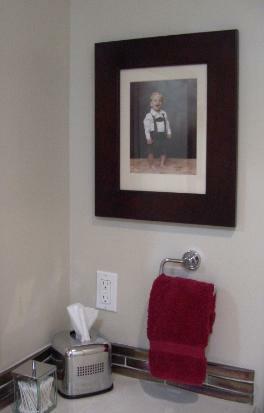 It helps to keep the clutter down in the bathroom, while having a beautiful photo to remind us of our [grandchildren]. 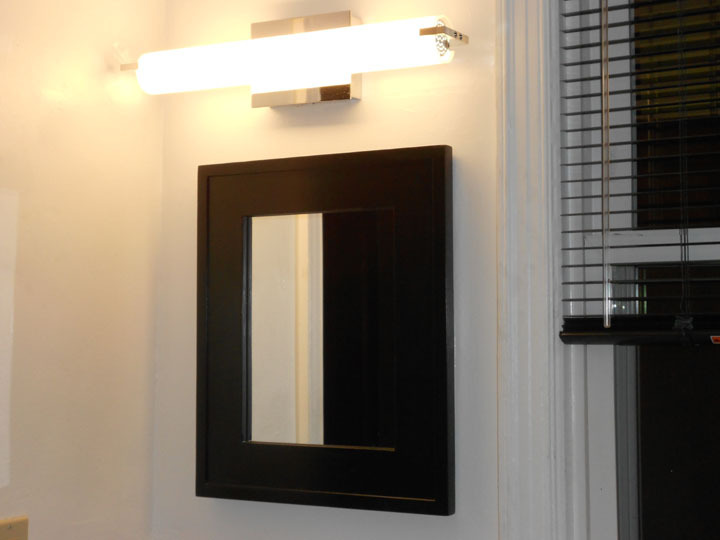 I wanted to go with the look of a beautiful framed mirror over the sink, but still needed a medicine cabinet at our fingertips, Concealed Cabinet is the perfect solution." 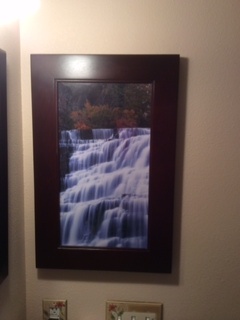 "We have a picture of the Grand Canyon in the frame right now, but we rotate pictures with the seasons or our mood... As you can see it is a great place for hiding our keys and spare garage door openers. 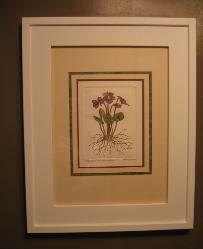 We absolutely love it -- will probably get another one sometime soon to use in the Master Bedroom. GREAT PRODUCT!!" 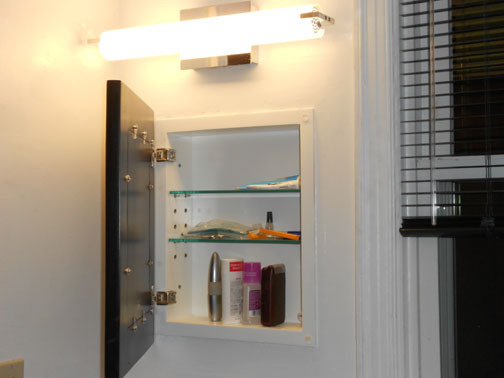 "The Concealed Cabinet... is both fun and functional. 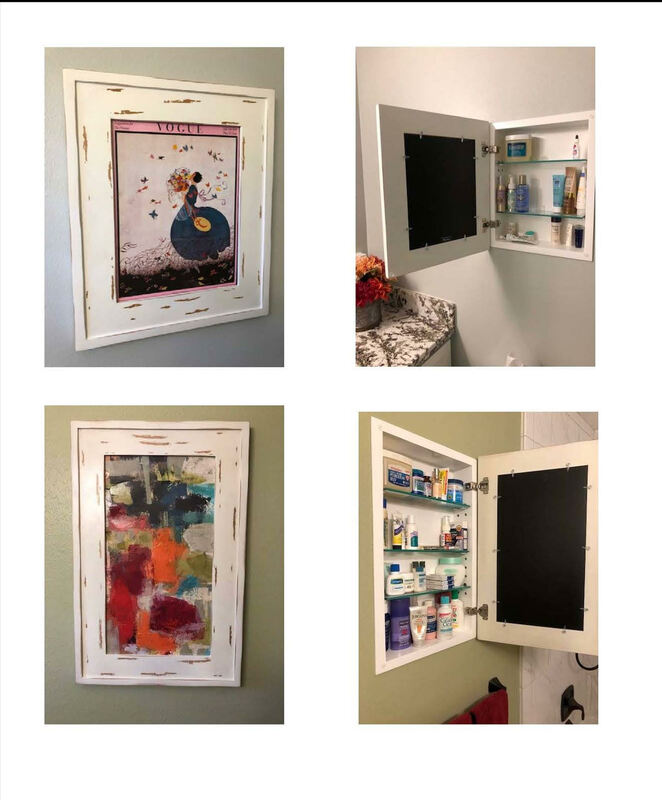 Our daughter, who is an architect, was first delighted to see the picture of her cats on the wall and then was impressed when she realized that there was a medicine cabinet behind the frame." 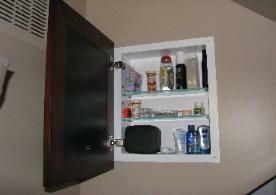 "I love my Concealed Cabinet. 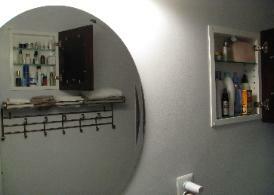 I... did not want another mirror to take away from the decorator mirror over the vanity. 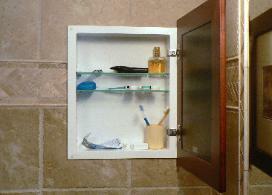 [The Concealed Cabinet] is a perfect size for the items I need to keep in the bathroom. 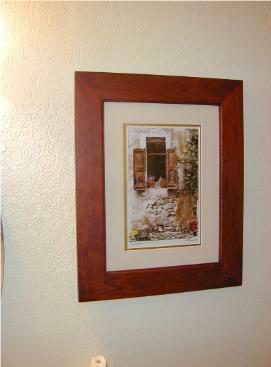 The frame fits standard size pictures. I am a very satisfied customer." "When we starting building our home, we looked for a medicine cabinet that would match our cabinetry, but not have that traditional 'medicine' cabinet look. 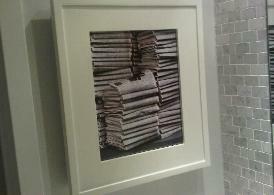 We love our new Concealed Cabinet... 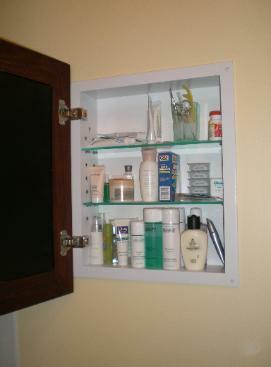 This is such a refined look for a medicine cabinet, no one even knows it is a medicine cabinet." 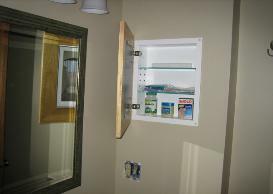 "(Here is) a picture of the Concealed Cabinet which has been installed in my new house. It is beautiful! 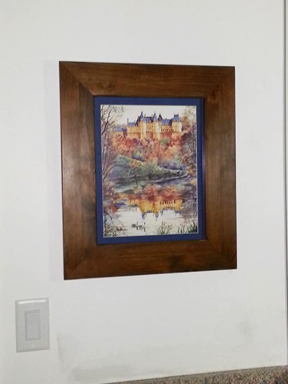 The print of the Biltmore House is by a local artist, and a local framer helped me with the print and mat. Just what I was looking for in my new home. 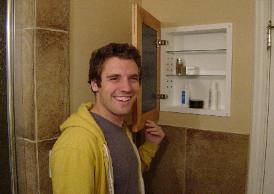 I wanted a medicine cabinet that did not have a mirror on the front, and this is the perfect answer. Thank you for your help. I hope you are pleased with the result, because I sure am!" 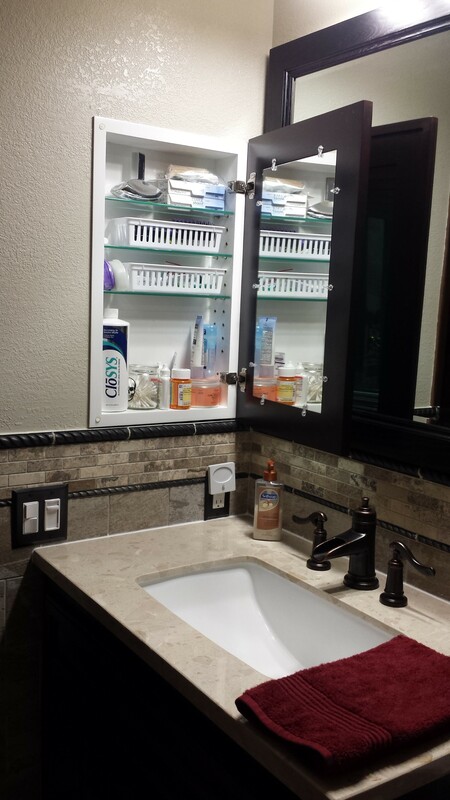 "I love my Concealed Cabinets -- I bought two (one large and one regular) and put them in a 30 yr old small bathroom that was remodeled. There is very little storage in the space, so the cabinets are great... Good idea you had -- glad that I found you on the web. 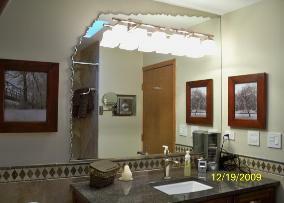 (The contractor who did the remodel was impressed with your cabinets, too!)" "We are totally pleased with all four of the Concealed Cabinets that we purchased, and have been since before they were even installed!.. 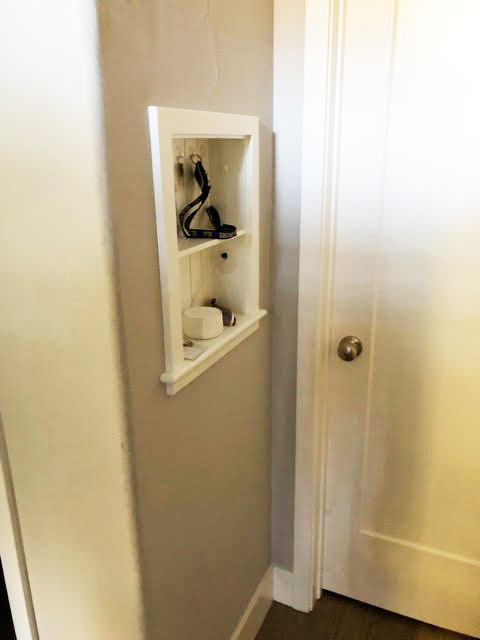 Stacking the cabinets in one of the guest bathrooms gave us a creative look and a safe high place for those toiletries that our littlest guests should not be accessing!.. Many thanks for your 'iInnovative' concept and beautifully crafted products." 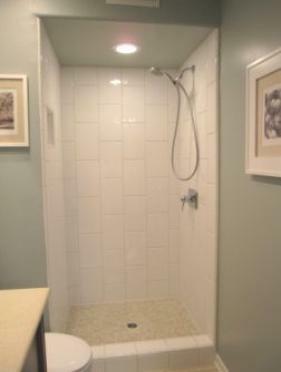 "I always show everyone who comes over to see our new bath remodel The Concealed Cabinet with our added feature and they are impressed. 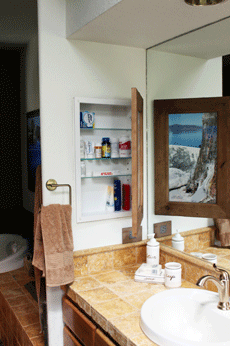 I would recommend this product to anyone who is tired of the mirror medicine cabinet." 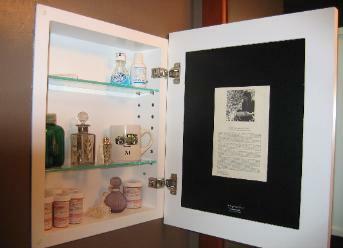 "After looking at hundreds of other recessed medicine cabinets, and nearly deciding to forgo the entire idea because of how ugly or plain they all were, I stumbled upon your very unique medicine cabinet [The Concealed Cabinet] and was hooked. Genius! 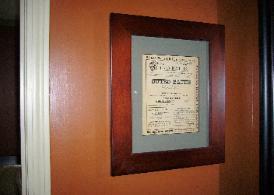 I placed my order lickety-split and it was in my wall less than a week later. Could not have been happier with the whole experience. 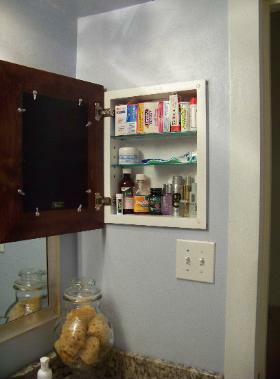 Thank you for making a beautiful medicine cabinet with no mirror!" 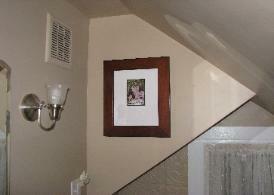 "Good product, excellent response time and service. Thanks." "I'm really happy that I found your website in my search. I get a lot of compliments from family and friends." 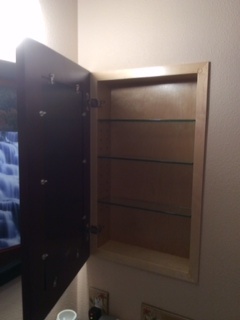 "I am very pleased with my Concealed Cabinet. Not only do I see a picture of my very happy great nephew every morning, but the clutter is gone from the counters. 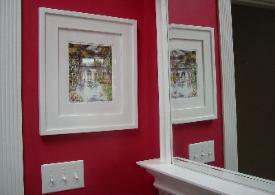 I would recommend the cabinets; they look great and are well-made, too." 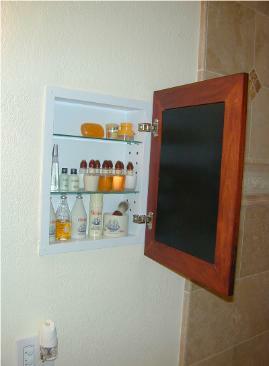 "We love our new Concealed Cabinet. [It's] the perfect solution!" 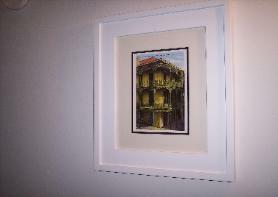 "I'm very pleased with the [Concealed Cabinet]... to have a mirror hanging over the vanity with this to the side certainly makes one assume that it is a framed piece of art." "We... were looking for a place to put our keys when we get home. 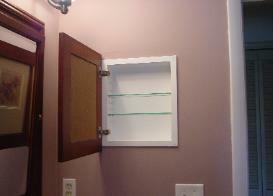 We bought a Concealed Cabinet and put it inside the front hallway, added a few hooks -- problem solved!" "WOW. I am so happy with my cabinets. We searched and searched for a medicine cabinet and didn't like anything we saw. 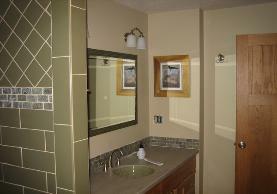 We wanted to use tile and a mirror for the vanity, but didn't want to lose space. 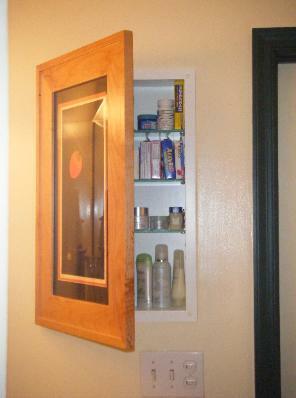 No worries with The Concealed Cabinets. They look great and are made well. Thanks!" 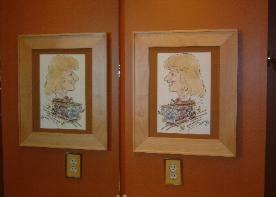 "I purchased two, unfinished cabinets, stained them the color of our cherry cabinets, put some commercial art in the frames, and WOW! They are MARVELOUS! 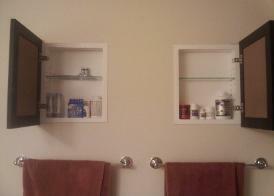 I could NOT live with standard commercial medicine cabinets in our new bathroom. Those are ugly. 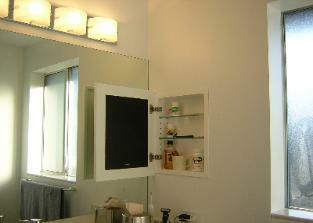 We really needed to maximize the use of space, your cabinets fulfilled that and are BEAUTIFUL! My husband remarks how nice they look also. I will recommend your cabinets when I can!" "What a wonderful idea! 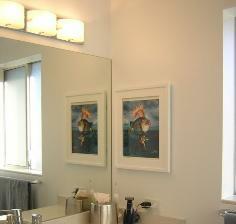 I have a really, really small bathroom where space is a main factor in design. 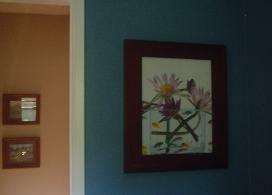 You have allowed me to have a beautiful picture frame AND a medicine cabinet in the same space! The contractor I hired for my bathroom remodel had never seen anything like it. The quality is top of the line. 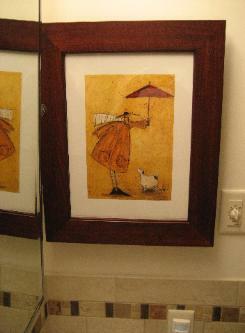 The contractor framed out my mirror to match The Concealed Cabinet. I'm very pleased with this purchase. The surprise factor is fun too. 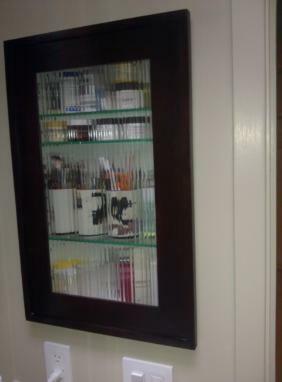 No one knows that it's a [medicine] cabinet until I show them. Thanks for making such a great product." 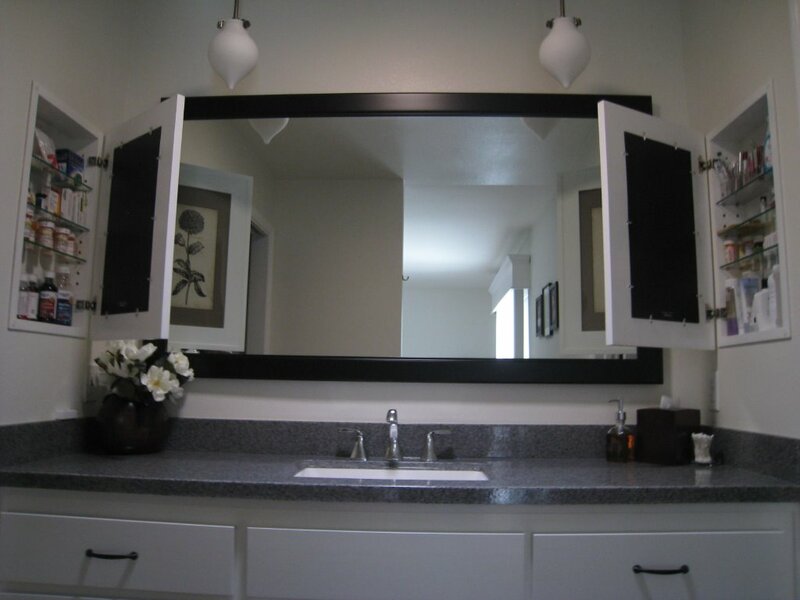 "I had a really hard time finding a recessed cabinet that didn't have a mirror... A mirrored cabinet would not look good with the large mirror next to it. I was lucky enough to find your website and decided this was the best option for me. 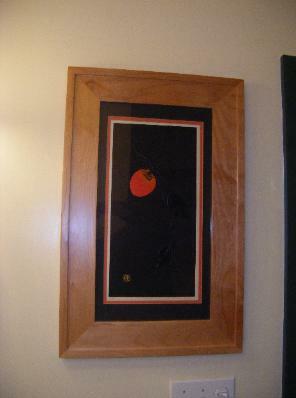 I love the cabinet and the fact that I was able to display a piece of artwork inside it. 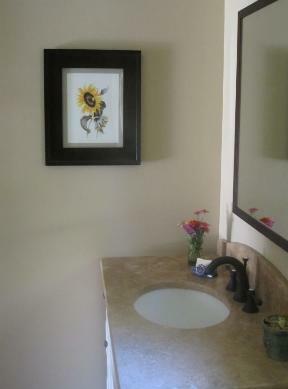 I was even showing a guest my remodeled bathroom and she had no idea that the artwork was a Concealed Cabinet until I opened it to show her!" 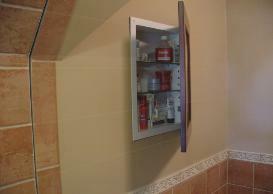 "Here are pictures of our beautiful Concealed Cabinet as it is installed in our very small bathroom. 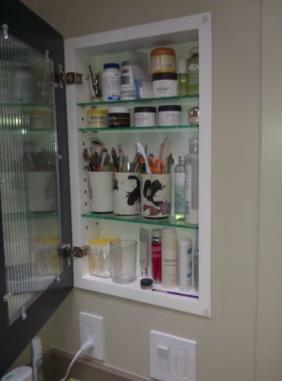 It was important for us to have as much storage space as we could get without making it look as if we had two medicine cabinets. 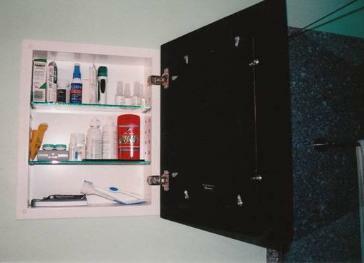 Your Concealed Cabinet was the perfect solution. I popped in a photo I had sitting around, but can easily change it out when I want. 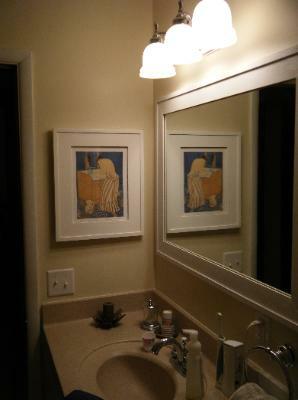 The cabinet is a very well-made piece and I love the way it looks in our bathroom. 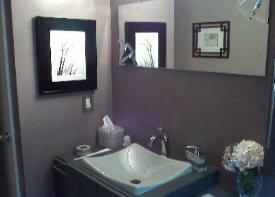 Debra H. - pleased customer"
"I had my bathroom remodeled with high end cabinetry and everything turned out beautiful. 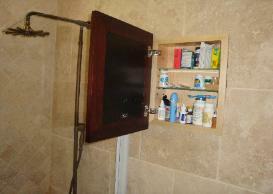 When I show off my new bathroom, all the attention goes to your Concealed Cabinet. 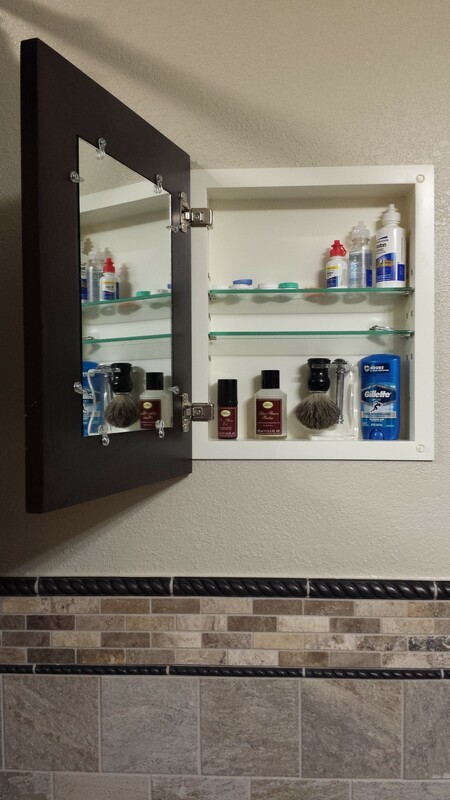 This cabinet sets off my new bathroom perfectly." 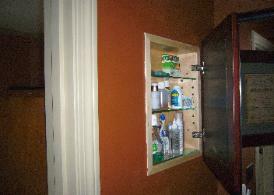 "We love our Large Concealed Cabinet. 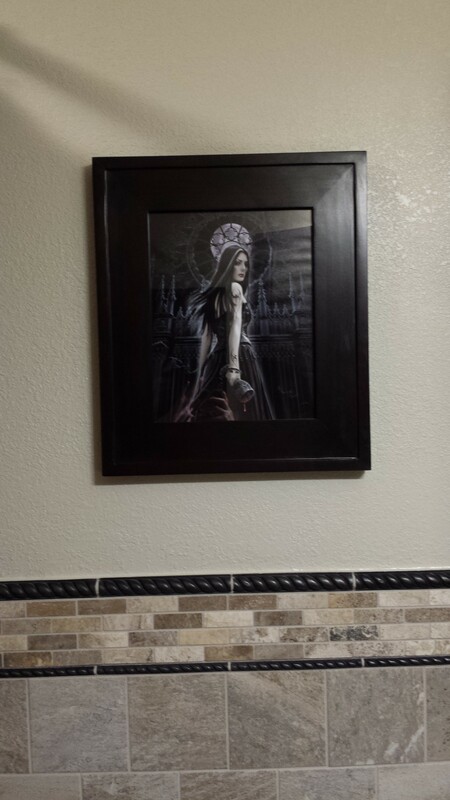 It fits perfectly into our new master bath. It is stylish and was very easy to install. 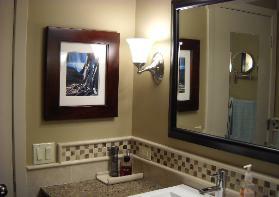 We have recommended it to all our friends who are also redoing their baths." 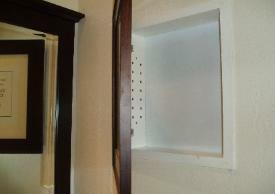 "I LOVE my Concealed Cabinet. The quality is top notch. 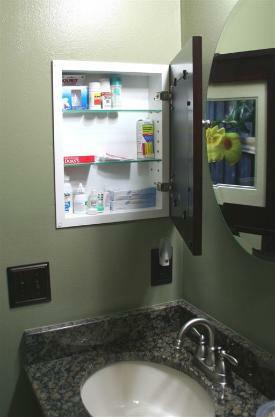 What a great alternative to those ugly, cheap mirrored medicine cabinets!" "You were the answer to my 2 to 3 month search for a cabinet that would fit into my house, which is old. The cabinets at the big-box stores and even on other online sites were either too big to fit between the vertical beams in a wall or just too cheap looking. When I got the item, I was content, but waited to write to see if anything would go wrong. 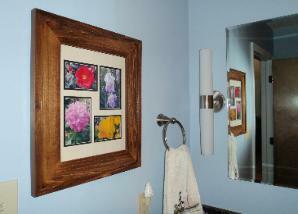 I got a mirror to fit where others may place art work. It is up and I am extremely happy. The cost, too, was very competitive, especially when I consider the extremely low quality of the other small cabinets that are available. Anyway, thanks for being available, providing me answers, and solving my problem and ending my search for a medicine cabinet that allows me to enjoy my bathroom." "The finished product. Thought you might like to see how it turned out. Love the cabinet - thanks!" "We love [our Concealed Cabinets]. They are easily our favorite thing to show people because they always surprise and they look so good." 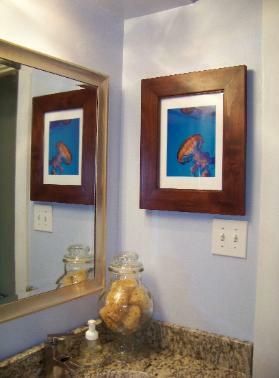 "One only needs so many mirrors in a bathroom and these cabinets allow a bit of elegance to be added by the addition of pictures instead." 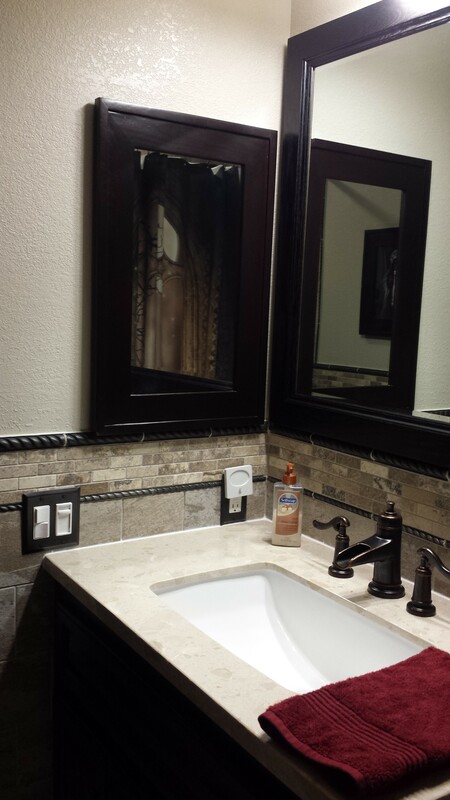 "We had a very unique issue with our small bathroom renovation and your Concealed Cabinet was able to resolve it perfectly...The excellent customer service and quick shipping was appreciated." 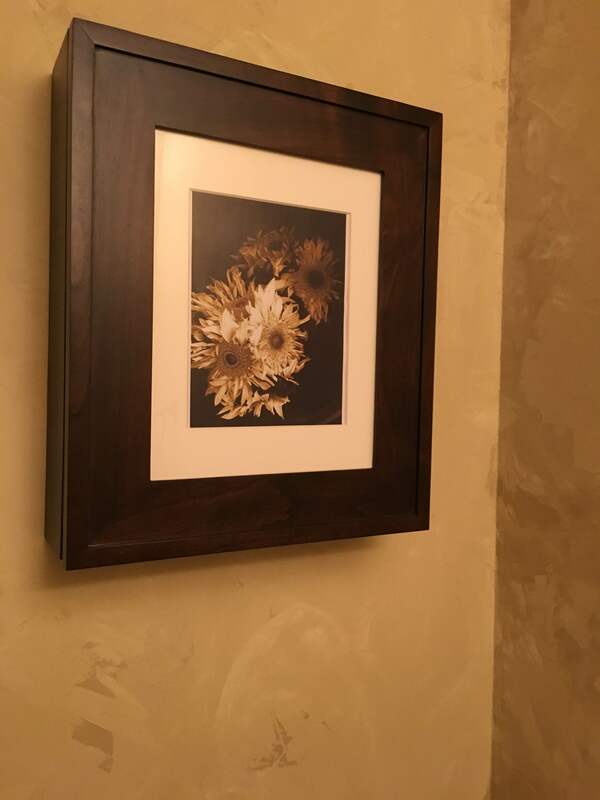 "I found this wonderful cabinet online, installed it on the opposite wall from the vanity and so far nobody can think it's anything but a pretty picture. I am 100% satisfied." To read C.'s full testimonial, click here. 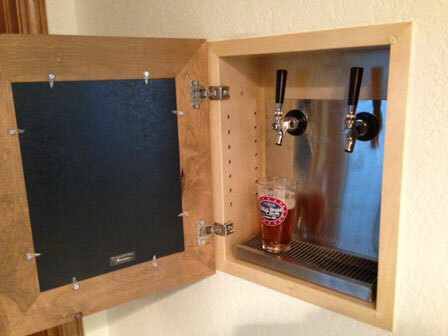 "I can't begin to describe how happy I am with my Concealed Cabinet. It is exactly what I was looking for. The quality is great and, of course, I love that I will be able to change the 'look' whenever I want. I show it off all the time." "Very nice product! We are proud to show it off." "We love the originality of the product and also the versatility." "Great solution for a thorny problem!!!" 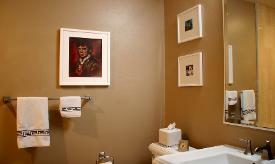 "It was the perfect solution for turning a powder room into a functional second bathroom." 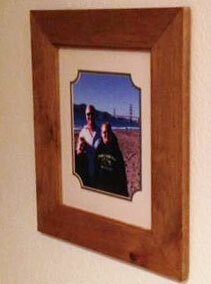 "We decided to forego the picture frame use and instead we purchased some beveled glass and glued it in. It looks great." "We looked on the internet for a while before we found something that met our needs and that was your cabinet." 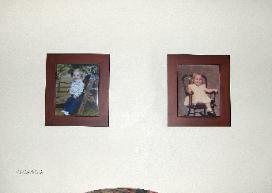 "I just want to say again that I am so pleased with my cabinets and I love the fact that they look like any other picture frame." 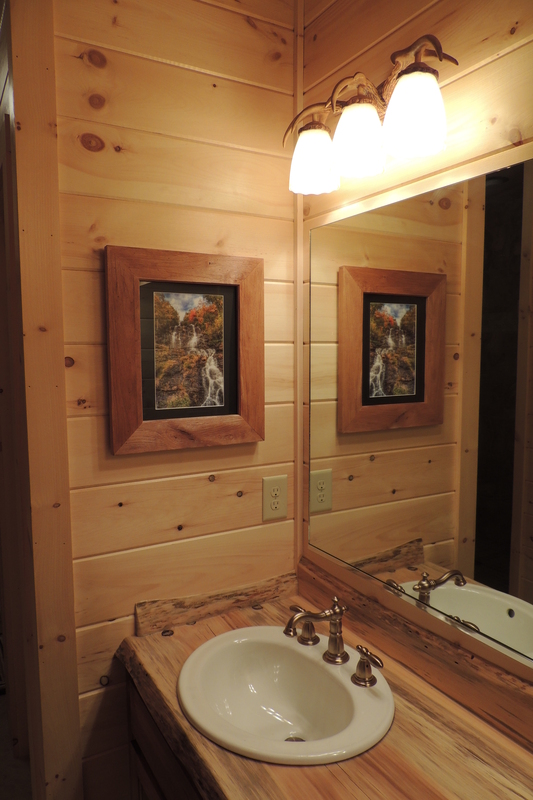 [The Concealed Cabinet] is a perfect accent to our newly remodeled bathroom." 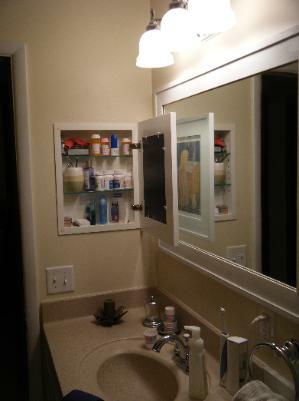 "This Concealed Cabinet makes my new bathroom more unique." "We love it, people are always surprised that it is a cabinet." 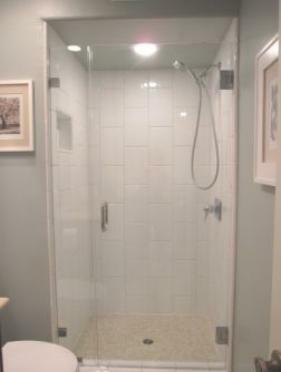 "Here are some pics of the finished shower. Everything looks great!! 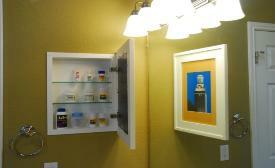 The medicine cabinet [is] on the right wall. 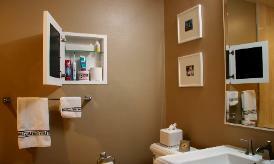 It is great for a small space like this." 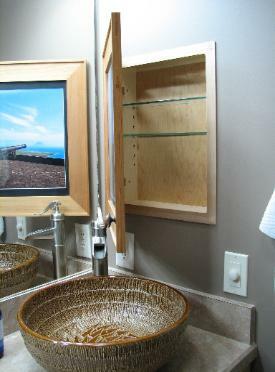 "Here is a photo of the cabinet installed. We absolutely love it. I think my husband is jealous and wants one for himself. 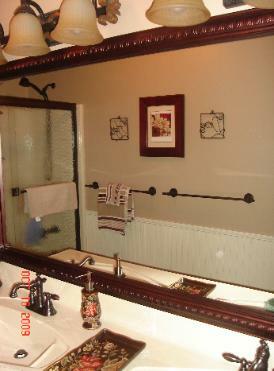 Thanks so very much, Sheryl"
"We finally completed the bathroom and the cabinet was the least trouble of anything! 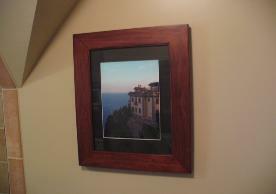 It is made so well with beautiful wood and is just balanced. 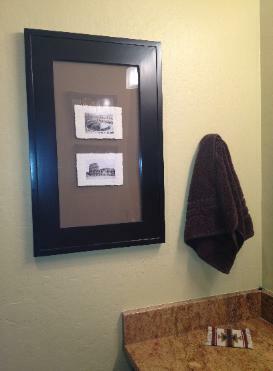 It is placed on the side wall beside our new freestanding furniture sink with mirror and we have many options for artwork to be displayed. 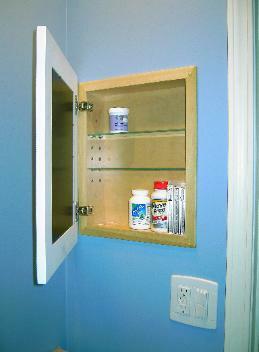 "It is the best investment and a hundred times better than any medicine cabinets out there. 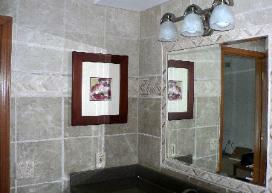 My new marble bathroom is truly exquisite and with the beautiful Concealed Cabinet - functional, too. 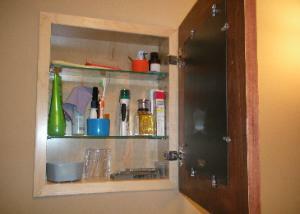 "I LOVE my concealed cabinet. 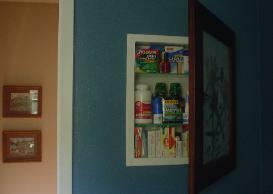 What a wonderful and artistic way to locate a medicine chest. 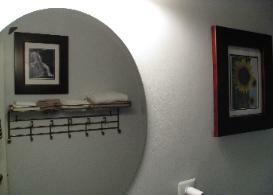 As I have proudly shown friends my first remodeled bathroom, most have marveled at the photo frame that opens to reveal my personal care requirements. While this second bathroom will no longer have the surprise element, I expect the impact of the piece to be equally stunning. 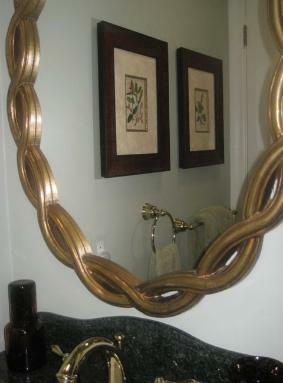 Congratulations on providing an elegant alternative to the usual chrome-framed mirror. Thanks!" "When I found the Concealed Cabinets online, I thought they were marvelous, and wondered why no one had thought of the concept before." 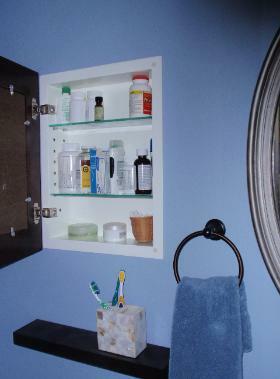 "After looking a just about every homely, ordinary medicine cabinet on the planet, I kept coming back to the Concealed Cabinets... And am pleased every morning when I brush my teeth and get to use mine. 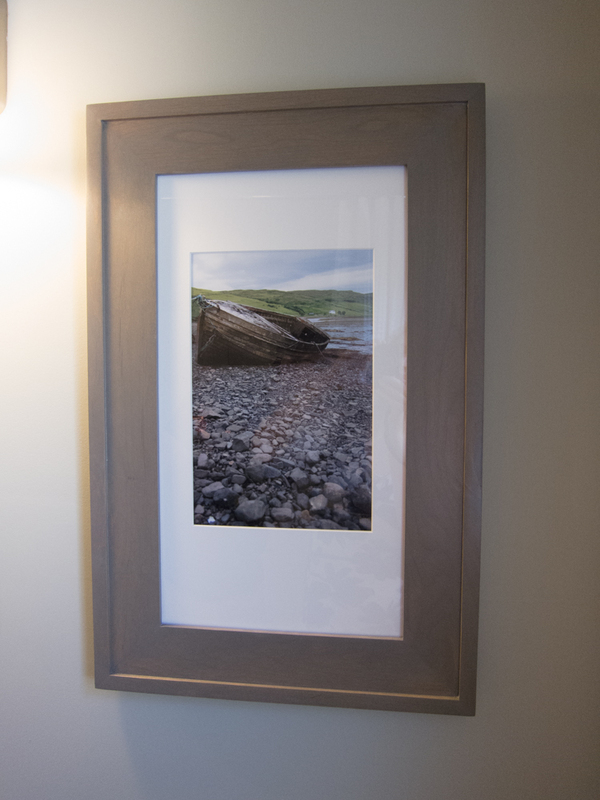 We haven't had the seasonal gallery of photos in them that we planned yet, but even with some simple posters ordered online, the cabinets are lovely and always a surprise when we show them off to friends... And we do! A house should be a reflection of those who dwell there... Our Concealed Cabinets are a curious alternative to the ordinary that most people accept. From the contractor who installed them to our son's friends who like his 'secret toothbrush wall' we could not be more pleased with your products. 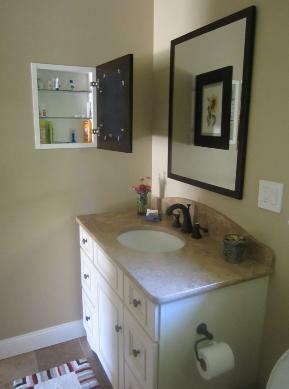 "Love the cabinet -- it was exactly what my bathroom/dressing area needed. Also appreciated the promptness of the delivery of the cabinet. I definitely recommend you to others." "I love the cabinets. They are just what I wanted, and no one even knows what's behind them!" If you're a past customer of The Concealed Cabinet and would like to be featured here, please email us at TheConcealedCabinet@gmail.com with pictures of your installed cabinet(s) and quotes.